Jyl Kelley, left, and Wanrudee Buranakorn look over images for their upcoming exhibit. It’s true that inspiration comes from anything, and in Wanrudee Buranakorn and Jyl Kelley’s latest gallery exhibit, it’s all about curiosity, collaboration, and connection. 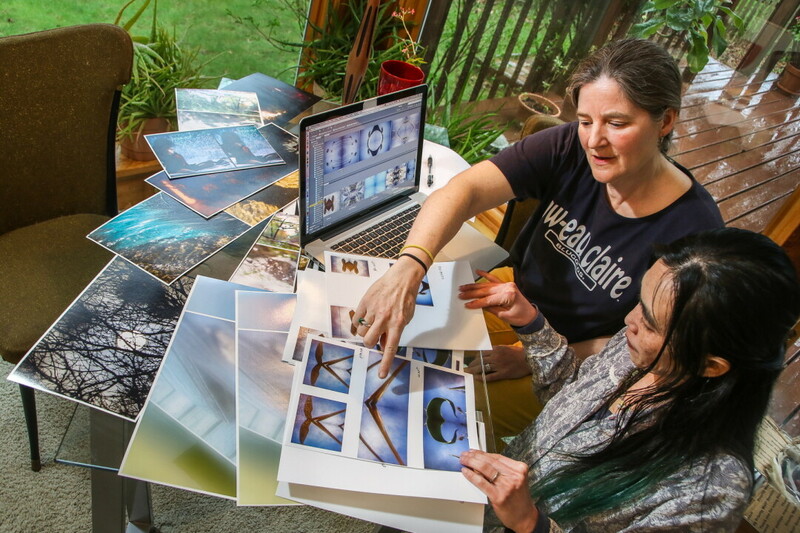 For the past nine years, both photography professors have been teaching together in the department of art and design at UW-Eau Claire, and over the summer, they each spent some time at artist residencies, Kelley in Finland and Buranakorn in South Carolina. Despite being thousands of miles apart, they discovered a shared fascination with the night sky in their artwork. It didn’t take long for the creative minds to team up and deliver an epic show, one offering a vision of mystical harmonies. The exhibit will run May 5 through June 1 at the Volume One Gallery, 205 N. Dewey St., Eau Claire, with an opening reception 6:30-8:30pm on Friday, May 5. Photography has always been a part of Buranakorn’s life, as her father was also a photographer. She found herself helping him in the studio, and soon making art became second nature, another way of nourishing her soul and expressing thoughts without words. Though creative projects are more difficult to complete during the academic year, Buranakorn and Kelley were excited to partner up for this show. They were awarded funds to support the project through UW-Eau Claire Small Research Grants Program, which allows them to share their art not only with their students and the UWEC community but also with those in the Chippewa Valley. In “We are Stardust,” both professors use photography as their medium because of its connection to time, light, and space along with how prevalent it is in our culture. Sets of related images are a part of this exhibition, allowing Buranakorn and Kelley to play with the theme of connectedness and see what elements come together. Over he past few years, Kelley has been capturing still frames of the night sky and piecing them together to create time-lapse animations of moving stars, which visitors will get to encounter along with other multimedia and video displays. According to Kelley, requiring the use of another sense allows individuals to fully experience the art and perceive a one-dimensional photographic scene another way. Her work includes animations and sound recordings, some of which were created this past year at the Kulttuurikeskus Vanha Paukku artist residency in Finland. She collaborated with Daniel Lee Ruff Smith to edit the sound for the video “Inside Out” and with Joyce Neimanas to co-direct the video “the fabric” with her time-lapse animations as backdrop. Kelley continues to experiment with new time-lapse animations as well as pinhole photographs. Instead of pointing her lens outward into the universe, she points it in a different direction to allow her another perspective and a view into very tiny worlds that she would not normally be able to observe. Learning more about the wonders of the night sky is still new to Wanrudee, and she has found that being immersed in nature has really supported her creativity. This summer, she plans to return to her artist residency in South Carolina just in time to experience what’s been dubbed the “Great American Eclipse,” which will be Aug. 21. During this total solar eclipse, a mighty darkness will sweep across the United States, the first eclipse to do so in almost 100 years. Buranakorn is looking forward to exploring her connection with the cosmos and natural phenomenon since she will be right inside the path of totality. “We Are Stardust” invites visitors to come to their own conclusions about the artworks and find new interpretations based on their own life experiences. In this remarkable gallery of great minds, you’ll encounter photographs, multimedia, and video displays that together create a magical tour of the night sky, one you certainly won’t want to miss!